The largest organ of the body, the skin is susceptible to a number of different conditions and issues. One such condition is granuloma annulare. Similar to eczema, granuloma annulare is characterized by raised, reddish to skin-colored bumps known as lesions. However, granuloma annulare typically appears in a circular or ring pattern found on the hands and feet. The signs and symptoms of granuloma annulare are actually dependent upon the variety: localized, generalized or subcutaneous. Localized granuloma annulare is the most common form and presents as a circular or semicircular shape or patter, ranging in diameter from miniscule to 2 inches. Generalized granuloma annulare is actually that which is present on a large portion of the body and is commonly found on the trunk, arms and legs. This form is often itchy and occurs most in adults. Subcutaneous granuloma annulare most commonly affects young children and actually presents as a firm lump beneath the skin rather than a rash. The lump is typically less than 1.5 inches in diameter. The specific cause of granuloma annulare is unknown; however, some possible contributing factors have been identified. Granuloma annulare may be brought on by animal or insect bites, infection, tuberculin skin tests, vaccinations or sun exposure. In many cases, granuloma annulare is not itchy or painful, so it does not require treatment. In any case, though, granuloma annulare typically responds well to herbal treatments, much like treatment for eczema. Common treatment options include apple cider vinegar applied topically and taken orally, DMSO, tannic acid, milk of magnesia and lysine. Additionally, vitamin E, tea tree oil, and green tea also aid in treatment and serve as a remedy for granuloma annulare and a treatment for eczema. My problem began after I cut my right index finger knuckle on a piece of sharp glass (drying a drilling glass and it broke). The granuloma annulare began in that injury then traveled up and down my index finger and then toward my thumb. That cleared up unexpectedly then showed up in the knuckle of my left middle finger where no injury had ever occurred. My husband has been using food grade 30% (@?) hydrogen peroxide and so I dabbed some on my a.g. each day and it began to go away. It has almost disappeared. First remedy that I have tried and it worked! After 1 year of my husband having the worst case of GA the dermatologist had seen and after being ask d to attend a Dermatological convention for further consultation which had no results, he starting taking a supplement for candida made of multiple enzymes (Amylase, Cellulase,Glucoamylase,Hemicellulase ,Invertase, L-Leucine) which is an enzyme therapy with no side effects. In days my husband stopped itching(he was itching constantly) and after 5 days his GA is disappearing and he feels so much better. I believe that this condition may be related to Candida. We tried numerous remedies after the usual steroid treatments did not work such as coconut oil, tea tree oil, apple cider vinegar, colloidal silver and though these helped relieve symptoms and did help some of the spots lessen, the disease persisted. It is a relatively inexpensive supplement. My husband also has this condition . What is the brand name of the enzyme supplement? Can you please tell me what enzymes (brand) for candida were used? May I ask? What is the name of the supplement? I've been living with GA for 5 years now from my neck to my toes. It developed immediately after an operation, but of course doctors said it wasn't related. My dermatologist has had me on light treatment, ointments, clobetasol, steroid creams. I've been on prednisone, plaquenil and dapsone for 5 years which are the only meds that keep it under control and from me tearing my itchy skin off. I'm tested constantly and for diabetes (obviously because of the prednisone and plaquenil which can affect my retina) but so far so good. It started to go away so I started to lessen the doses, but it came back with a vengeance. I'm so glad I came across this site, since my next step was to go to Boston Medical, but afraid that will just mean more meds. As soon as I post this, I'm going to try the ACV. I'm sure willing to try anything that is a lot healthier than medication. Cause of Granuloma Annulare may be systemic Candida. 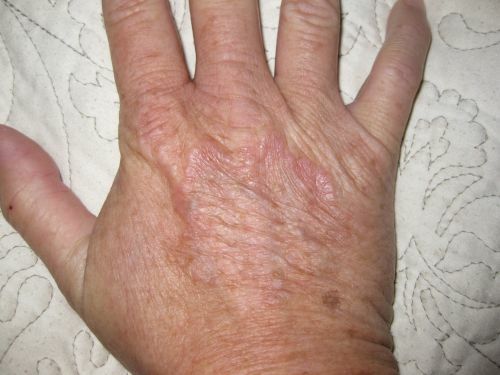 I have had granuloma annulare on my hands for about 25 years now (see picture). It was only on one hand for many years, then seemed to have travelled up to my fingers and it became prevalent on my left hand as well. It's as if it moved/shifted. When I bumped it, it hurt. About 2 months ago, I had a blood panel done and it was found that I had Systemic Candida (Albicans) which was contributing to many painful problems in my stomach area. It has been about 5 weeks now since I've been on an Anti-Candida diet (as well as a diet for my Leaky Gut) and I can truly say that almost all of my Granuloma Annulare has cleared up on both hands! At least you really have to look hard to see it. Just wanted to encourage others that if they have granuloma annulare, go get a blood panel done for Candida Albicans. If it shows >1, then you may have Systemic Candida. My nutritionist said that most everyone she meets that has an auto-immune disease almost always has Systemic Candida, but not every Systemic Candida patient has an auto-immune disease…not yet. She said doctors don't know much about Candida, so they miss it altogether. I really felt that this is the key to my health problems and feel much better, although it's very tough for me to stick out this diet for 2 months. I hope this helps everyone suffering with this same strange phenomenon. God bless. I have had granuloma Annulare now for 3 years. Started on my stomach and went to my arms and hand. It's a very frustrating skin problem. I always go back to what I was doing when it started. I started taking garden of life herbal products and within 3 days it just appeared. I didn't really think too much about it because the store claimed my skin breakouts was part of detoxing. And I switched products and used other brands. I also did apple cider vinegar. I also take adderall for addhd. I find if I stay off herbs and acid foods, it goes away. And alcohol makes it even worse. I am going to go on a anti fungal diet and see how that goes. Dr kaufman on you tube has a the diet available. Does anyone else have a problem loosing weight with this? Hello everybody … I have had GA for about ten years it developed after Hep B innoculations (I work in a Hospital). A good friend also has GA and is a nurse – also had Hep B innocs. I was taking cider vinegar long before GA appeared (I also tried Puva, nothing topical works) ACV is good for so many things I was taking it for joint stiffness and depression. I have to report that when I am away and don't take ACV – the GA shows up even more (evident most of the time anyway) It is extensive, armpits, inside area of arms, shoulders, tops of thighs and backs of knees and right across the tummy. Great!! I only take ACV in the morning but am going to increase to the evening too – I take it in hot water – maybe it shouldn't be diluted? I don't want to avoid Gluten and be ceoliac (! ) I love my bread…. What dose have you found to be helpful? What dose of ACV are you taking? I have GA everywhere except my face and it's spread to my neck. I've only had it a few months. Over the last year my GA has gone from, no biggie, to horrid. Now my back, stomach, chest and on occasion my thighs are covered w ugly red bumps. I MUST do something to stop this break out. Right now I am taking turmeric supplement, not helping. Gay, have u tried staying away from sugar and grains (and dairy) for a week? I am a 63 yr old female with generalized granuloma annulare for 15 yrs now. It began as 1 lesion above my left knee and several on the back of my neck. Of course I've seen multiple doctors in multiple disciplines and tried countless medications. The only somewhat effective treatment has been oral steroids which can only be used temporarily. Over the yrs the lesions have spread absolutely everywhere. Symmetrically on hands, feet, shins, forearms, elbows. Showed up, stayed for months, destroyed the collagen and moved on to torment the next location. For the past 5 yrs my entire torso, upper thighs, and the back of my neck have been solidly covered. I've tried removing several possible dietary offenders with no success, UNTIL 3 wks ago when I went gluten free. I can't believe this! My skin is actually clearing up! This is the most wonderful thing. Why has no one tested me for gluten sensitivity in all these yrs? A naturopath I consulted in April advised me that GA was an autoimmune disease due to leaky gut and to avoid dairy, sugar, potato and all gluten, e.g. wheat, barley, rye, all grains. I thought it would be ok to have buckwheat, amaranth, but no. Next stage to avoid legumes. Granuloma Annulare: The medicinal mushrooms work for me. They have been around for thousands of years! They are the most revered in all of Asia.They are known for regulating your immune system. There's nothing like them. Which specific mushrooms? How do you take? Tincture, tea, powdered? Do you have a good source for high quality? Hi, my wife has had GA for about 25 years and it was getting worse, covering about 30% of her abdomen. About 6 months ago she started taking 1 teaspoon of MSM with lemon juice almost every day. It is now almost all disappeared. I hope this helps. Have had some issues since 2010, minor and didn't worry over, as small spots came and went from arms and legs. About 2 years ago, I had major patches start on legs and connecting to each other from ankle to mid calf. Noticeable enough for people to ask about. Very Red and very noticeable. Arms which are freckled are scarred (I guess that would be correct) with small plain white circles because when a small circle leaves, it takes the freckles with it. Kept reading all of these posts and trying different things. I have zero clue if 1 of these 2 things are the reason I am in fantastic shape or if it is a combination of both. I take 30mg Pregnenolone w/ my daily meds. I also spray Colloidal Silver on a cotton ball at night and rub it on legs and arms. I know nothing about these 2 items other than since I started about a month ago, arms are pretty clear, and my legs are smooth. You have to look hard to see anything now. However, if I forget to swab the silver, they appear to get redder and can be seen. I am assuming if I can continue, things will leave. I have struggled with 2-3 fingerpads on each hand having the GA under the skin where it leaves a major ridge and is VERY painful. Since doing this, all fingers are clear. I did see a dermatologist, did the creams, said they would probably go away on their own, etc. and no real cure. Let him put shots into finger (thought I was going to die from the pain and I have a high thresh hold). Nothing helped. I am convinced my 2 options are working beautifully. I could be one or the other, but since I started them together, I don't know! I am thankful for this website and posts. HI, I have had this condition on and off for a few years got worse as I got older. Last year I had a flare up and not knowing what it was I suffered for months. I went to many Dr's no help. I slathered everything on me to no avail. I was finally told to try no gluten. (I also have a thyroid condition) Well no gluten, no rash!!! Just a thought to try. It took about a month for the rash to go away and if I eat gluten I immediately get a rash on my legs. I have GA – going on 8 years. It started with one round spot on my left shin and spread to two more spots on my lower left leg. It eventually spread to my right leg. I was diagnosed with Hashimoto's – hypothyroidism over 35 years ago. Took Synthroid for many years, now taking generic Armor thyroid. I thought that I might have an allergy to the Synthroid causing the GA. I have tried a dozen creams, mega doses of B3 prescribed by a dematologist, which did nothing for my spots, but gave me acid reflux. I have recently been applying tea tree oil and thyme oil with a cotton ball to my spots. I am going to try applying the ACV topically on my legs, which are sometimes itchy. I also have fibromyalgia. Eating organic, getting a good night's sleep, avoiding sugar, processed foods and gluten all seem to help. I recently developed symptoms of arthritis and psoriasis. I discovered that cashews and walnuts are high histamine foods, so now I'm not eating those anymore. I am also taking a multivitamin supplement, turmeric, MSM, calcium, magnesium, Vitamin E and drinking green tea. It's too bad that doctors seem clueless as to how to treat GA. It is comforting to know that there are other people out there with the same issues. Thank you for sharing your stories. I am also comforted finding this page today. I have had GA now for 2 1/2 years. It started on both my knees & elbows, then one large circle on my foot and now little ones on my legs and other foot. It is so upsetting b/c I ( as I read many here ) have tried so many different creams, oils, supplements etc.. and the only thing the dermatologist recommends is a steroid cream, which I don't want to use and can't now b/c I am pregnant. I am determined to heal this before summer so I can wear shorts and not feel self conscious. I am going to try the ACV topically and internally to start and see what happens– if I notice any change. I am slightly jaded b/c nothing ever works to change this– they only get redder and spread. It's so disheartening. I developed GA a few months ago, and in my research, ran across another forum. A man said that his wife had the condition, and began taking low dose (5 mg, 5 days a week) pregnenolone with good results. I ordered some and had only been taking it for a couple of weeks when I saw that my lesions were clearing up. I continue to have them pop up, but they don't last long. Considering taking 10 mg for a while to see if it might help to prevent new eruptions. I'm also going to try apple cider vinegar topically, as some people have had good results with that. I stumbled upon helichrysum oil trying to heal poor hearing. It is supposed to do marvelous things, so I put it on my hands where the Granuloma Annulare is. I put in on maybe 3-5 days in a row just before bed and it immediately went away with no scaring or anything. I have just noticed a small spot on my hand so I will use the oil again tonight and think it should be gone in a couple of days. It had remained gone originally for over 2 years. Did you mix the oil with a carrier oil? I am a 71 year old female who contracted Granuloma Annulare in March of 2014. This diagnosis was confirmed by a biopsy. I tried a number of different remedies, some suggested here and I found I felt much better taking raw apple cider vinegar with mother every day but there was little or no impact on the rash. It presented itself in all it delightful variations and generally looked like creeping crud with wine-port stain coloration. Very upsetting. My Dermatologist started me on Hydroxyclor which had little or no impact on the GA but REALLY helped my arthritic fingers. Great, but still GA was a huge issue. In Placerville we have Grandpa's Pharmacy, a compounding medication pharmacy which makes their own compounds right there on the premises. I called them after I read how they helped someone else with another issue totally unrelated to GA and asked if they had something for me. The pharmacist suggested I try Low-Dose Naltrexone and explained I would need a Dr's RX to get it. I composed an impressive release of liability for my Dr, which even extended to any claims my children may present if I died from this treatment, laced up my combat boots and asked my Dr. for the RX. She was reluctant, but saw I was serious (I asked her where she got her first clue) & she gave me the RX. I have been taking Low-Dose Naltrexone as a capsule for 6 weeks now and the rash on the inside of my wrists is gone, the bumps on my knuckles are barely visible, the rash all over my back and the rest of my body is about 50% of the boldness that it was and I am not finding it in any new places. The Pharmacist said it may take up to 9 months, and I am seriously considering a maintenance dose once I have totally won. Nancy, I'm glad the low-dose Naltrexone worked for you! I had high hopes for it as well. I've had Granuloma Annulare for over 40 years. It has only gone away for me while I was pregnant (26 years ago)… came back with a vengeance once my daughter was born. I also have Hashimoto's Thyroiditis… so I have tried the low-dose Naltrexone (LDN), have been on it at both 2mg and 3mg doses for over a year and my GA (both Generalized and Localized varieties) has not improved at all. I am continuing with the LDN however just because it helps me sleep extremely well and I am rarely sick with a cold or virus anymore. I do have a couple small patches of GA on my face and eyelids, huge rings on my hands (these are the only tender painful areas), some on my feet and stomach, a lot on my elbows and my neck/chest area. I have tried ACV, Clobestol (watch out! This is super potent.. it has ruined the skin on my hands), Plaquenil, all sorts of lotions, creams, vitamins and other home remedies to no avail. To parents of small children: In almost every case of childhood GA, it will clear on it's own within a couple years. It seems to become chronic more often when it starts in the teenage years (as it did with me) or in adulthood. If you are on this message board still, Nancy, this helped another Nancy a lot. I have just started LDN for GA and still getting new spots, more of them in fact. But this gives me hope that when I get up to a fuller dose and stay with it there may be more help to come. Plus I love your sense of humor and thoughtfulness. Thank you. I have had GA for 4 yrs. my worst breakout was 3 yrs ago. I was living in Rocheste, Mn. At the time. I had it ALL over my body, on my neck creeping to my Face. The Mayo Clinic Derm's (4 of them), told me I was the worst case they had ever seen. I was given 2 drugs, doxycycline & hydrochoquin (sp.) I was to take for 3 months. I took them for 3 weeks & I broke out in secondary rash (all over my body now) I was a mess. I itched sooo bad I was in tears. I was put in the hospital for 2 days in wet wraps. I looked like a mummy. I am now 65. It has been fading for almost 3 yrs. It started fading only after I was under the care of chiropractor. I had cortisone ointments, creams prednisone, injected cortisone shots & nothing worked. I also took ACV tabs & lysine, biotin&D3 supplements, nothing. I was told it was most likely brought on by stess. I also, had blood tests & a colonoscopy & nothing turned up unusual. That was 3 yrs ago. I still have lesion marks, on my arms legs, top of feet, & torso. I am doing ion detox foot baths, I have had 3 (1st one was 5 days ago) and I am amazed how much toxins are leaching out of my feet. The water was brownish black & had a fishy oder to it. Mostly liver & cell tissue. I am beginning to see my lesions fade even more..
For those of you who are adults, I would look into a reputable med spa & have the ion detox foot bath and also lymphatic drainage massage. Because toxins in your body are NOT good. Also, I have never smoked and occasionally will have wine or alcohol. I will do the ion detox foot bath 2 more times, I am driving back to Mn. next week. I hope to find somewhere in the Twin Cities that do these. Also, @ the Med Spa in Parker its $30.00 a time..
P.s. This is a short version of this crap called Generalized disseminated Granuloma annulare…..
B: Thanx for the positive post on detoxing. If I might add, doing the ion detox spa from health professionals is a great start, but if you think that many more spas may be necessary you can purchase your own unit from the internet and use in your home. Also, I find detox foot pads very effective for cleansing. Also, it is a good practice to take herbal antibiotics like Garlic, Oregano, Neem, Mrrrh, Echinacea, Oregon Grape, Olive Leaf, etc as there are a number of residual parasites & pathogens released back into the bloodstream fallowing the spa (most go into the spa water). Clay, or Charcoal may be necessary before retiring. You may also consider the detox mineral hot baths recommended here on E.C. 1/4 cup Borax & 1/4 cup Epsom Salts for 1 hr once per wk until better. My 5 years old daughter is suffering form Granuloma Annulare from past 2 years. We used Apple Cider Vinegar externally for 5-6 days at night. It disappeared completely but after 3 months it appeared again, but not at the same spot, rather little away from it. Kindly suggest some remedy. Can we give her ACV orally? Seeing that you have had success with ACV topically, I would try that again. And I have given ACV to my young children without any problem. I would start with 1/4 teaspoon in water or juice a couple of times a day. If that seems okay, 1/2 teaspoon a couple of times a day could be tried. Cassandra from East Chicago, In. My five yr. old daughter is suffering from the same thing and she has been to the doctor for this and giving her an ointment that is 2.5mg and it's not working so I'm going to try your home remedy to see if it works she's been suffering with this since she was two yrs.old. I like the idea. I have had GA for a number of years with no relief. I have been to 2 doctors. My husband is driving me crazy telling me there has to be something I can do. I am going to try the ACV and praying this works. It is all over, even my ears. Fortunately I don't have it on my face yet. My mother said my grandfather had red places on the tops of his feet but no one ever knew what it was. I am diabetic so I am sure this has something to do with it. Crossing fingers this works. I have had GA going on 8 years. I was in what I call remission for the past 2 years after being prescribed Accutane. I was unable to complete the full three mths of medication, due to high triglycerides. However the GA did disappear for two years. It has recently returned. I will not take anymore steroids be it cream or oral medication. While taking the steroids I became Diabetic. I went through several Doctors ( Dermatologists ) not to mention the Internists and General MDs. I have taken leprosy meds, steroids, and more topical creams than I can remember, steroid and non-steroid. I would love to try a natural remedy before taking the Accutane again. Suggestions??? My husband has the localized variety, I guess, on his hands and elbows. It appeared suddenly as bumps, one day last summer, after he came home from work outdoors. Since then, the bumps became spreading red rings. He also has diabetes, for which he started taking iodine internally again almost a month ago, having lapsed for about a year and noticed a significant difference in his health. Interestingly, the iodine seems to be helping reduce the size of the GA patches. He started out at 3 drops and increased to 9-12 drops of 7% Lugol's Solution iodine in divided doses twice/day, mixed with about 6-8 oz. water each time. He's going to increase to 18 drops and see if it takes care of it completely. I'll post an update with results. Please try lysine for Granuloma Annulare. I take 1 pill sometimes 2 pills a day. Went to doctor and they said there is no cure for Granuloma Annulare. Tried everything and this condition was spreading everywhere on joint areas and more. Decided to try lysine cause I get fever blisters so I have herpes virus and lysine is good for this, so I thought to try this for granuloma and it has made me feel not like a freak anymore. Hands are almost clear and am able to show them now and knees and ankles clearing up. This is like a God send to me. Also I eat a lot of sugars which I read absorbs the lysine or whatever in the body. This is truly working and believe me, I have tried everything. Don't know what dose you should take but I truly believe it is working and still take it today. Is this still working for you? Have had GA for 30 years. It's the worst I've ever seen. Huge red bumps front & back all over my legs' knuckles&wrists. Look forward to your reply. Thank you. Is the Lysine still working for your GA? I have been able to stop my Granuloma Annulare with a taking the Apple Cider Vinegar liquid 1 Tbs. two times a day 1 Tbs. of Silver Biotics each time. You can purchase the ACV and the Silver Biotics at GNC. I mix them with 1 Tbs. of orange juice so it doesn't taste as bad. I have been taking daily vitamins D3 1000 IU, Coenzyme Q10, Vitamin C, Echinacea, and Fish Oil. I bought all of these at Target. I take the dosages recommended on the bottle. I have also been drinking herbal green tea in the morning and Echinacea tea in the evening. I also put Cortizone 10 on the spots in the morning and at night. I still have some red spots but they seem to be fading away. This site was really helpful in getting me started getting over the Granuloma Annulare and wanted to share my recovery story. Thanks to all of you who shared your information about Granuloma Annulare! I have had this for about 3 years now. My Dermatologist gives me a low dose steroid shot in the rear, and I then go for a few sessions of UV at the tanning parlour. This clears it up for 6 months or more. Can you tell me about the bleach baths? Like a cup in a bath tub?? Does it matter what kind? Household bleach?? Hi, Jenni. I have just started the ACV 2x per day: 1/2 oz in 12 oz of luke warm water. It's not that bad after a while! I am only into it a week, but am optimistic. This is such a mysterious, troubling condition. I too, am so encouraged! Will be praying for success for all of us!! OMG it was so nice to know I am not alone in this. I have had GA for over a year and it is driving me crazy as my husband doesn't think its a problem but as some one else said its crushing my spirit and making me lack confidence as yes it is summer and I am constantly covering up! I tried steroid cream, ACV, calendula, aloe vera, flax seed and coconut oil and my skin is getting worse! Please help, I will try anything. thank you all for sharing your stories, it makes me able to cope better with this skin problem. I am so glad to find this site. My derm tried a malarial and leprosy drug, that he said sometimes helps. He also had me try a potent steroid cream that actually makes it hurt. None of his trys did a thing for me. My legs, arms, hands, abdomen and back are affected. Mine keeps getting worse. First appeared in September. Researching it and my Dr. said individuals with diabetes are more likely to get it. I have Type 1. It also says it is an inflammatory process. I am trying to follow a diet that is "clean" no sugar and minimal processed foods. I'm also going to get Turmeric which is suppose to help the immune system. I am going to try all of the suggestions. I was wondering if essential oils might help. I'm ready to try anything and look forward to all suggestions. Hi all, I have suffered from this dreaded skin condition for coming up on 9 yrs now, I have the generalised, going from my shoulders, down to my shins, arms, legs, back, front. It is embarrassing, and I don't like to show my body to anyone, because of it. I have had all the treatments medically you could think of, from PUVA, to freezing them, to all the oral medications, and cortizone creams, and nothing has worked, though some of them took this dreaded condition away whilst I was on the medication, as soon as I stopped, it came back. I have given up on seeking medical help now, as its a waste of my money, nothing is working, and it seems to be spreading, my whole stomach is just full of red lumps. I have read some suggestions, and will give ACV a go, but I won't hold my breath, thats for sure, just getting so frustrated that nothing has worked, and I have been battling this for 9 yrs. I am also going to try Acupuncture, at a point now where I will give anything a go. I am wondering if anyone can tell me, if they know if maybe surgery may have started this, I had an operation on my ankle 10 yrs ago, involving pins and plates and screws, just wondering if this may be a starting point for this condition in my case. Note that I'm not a medical person. I'm a person who had granuloma for five years. It went away by itself but now I understand it. I truly believe the problem is that granuloma is treated as a skin condition when it is NOT a skin condition. It is a blood condition like left-shift Leukocytosis (increased white blood cells). There have been no direct studies that I know of but I do know that a dermatologist can not cure it. Perhaps a hematologist can treat the Leukocytosis and that will cure the symptom, I.e., the white blood cells clumping up to the surface of the skin appearing as a rash. I've had chronic Granuloma Annulare for 44 years and in all that time it only disappeared for 2 years and then came back with a vengence. I have tried all the treatments including injections of cortisone over long periods of time to no effect. I then turned to natural therapies but still have not found anything that's effective, including apple cider vinegar. But now I'm beginning to agree that Dennis from Florida might be onto something regarding it being a blood condition. Now if only we could find a suitable treatment for that then there might be a chance. Another thing I've noticed is most articles say GA is not painful. That's not true. I suffer great pain in my hands when I do things and also when I knock or bump them. Please tell me I'm not the only one who experiences this. How did your condition go away? I've had it since I was 12 and now 30. It went away completely during both pregnancies and came back full force. Any other info you can share would be greatly appreciated. Thank you. I developed this stuff on my left hand only in my thirties, and I'm now 62. I really did nothing for it because doc says there's no cure and it was just itchy and red. Then it switched to my right hand only for about six months. Then, walla, it just went away about a year ago. Does this stuff go into remission for whatever reason and could return? I've had no surgeries; nothing different in my life other than a three month period of great stress due to family illness. "Does this stuff go into remission for whatever reason and could return?" Yes and yes. Granuloma Annulare just goes away on it's own for some people, especially children. I have heard of people with GA that become clear for years and then it will return. It is probably auto-immune in that it almost always disappears during pregnancy and comes back after the baby is born (like many other auto-immune diseases). Dhanishta; Don't feel alone! I have a high threshold for pain but now when I bang the top of my hands where my major rings are, it hurts and for a long time. A real wounded painful ache like damage was done. I now have new rings expanding from the edges of old rings. Now on both hands, up my arm around my elbows and around an ankle. My first spot started exactly where I had a localized X-ray. But I fear my main culprits were wasp and hornet stings I get in the summers working outside. I didn't react badly at the time but am now breaking out at at those attacked areas. It is horrid! I will experiment and will inform with any positive results. I will try hemp oil and lotions, since I live in Co. And will see if that helps. Good luck all! You are not the only one as far as when I bump them there is intense pain. It doesn't last long but I usually develop another under the skin nodule. I have the generalized type. Yes, I too suffer with the terrible itch and pain. My GA is on the tops of both hands. It hurts very bad if I bump them on something. It also tends to itch occasionally but not very often. I have GA going on 3 years it’s depressing and not much fun to be In AZ and not wanting to wear shorts in 110+ degree weather. I came across this article https://www.ncbi.nlm.nih.gov/pmc/articles/PMC5447348/. I am going to try this if I can find a Dr. who will help me. Let me know if anyone has experienced with this treatment. Interesting, I believe your on to something here. I’ve always thought it was blood related some how. I had it once and it did clear up on its own in about 2 years like I had read, nothing really helped. I now have it again and want to have a blood panel done. Your post is from 2015. If you have any further knowledge id love to get the info somehow. My now 8 year old daughter has diagnosed with Granuloma Annulare 3 years ago. We found that using a Vitamin D spray at about 3 pumps at a time 1x a day, children's probiotics and 500-1000 mg. of Vitamin C that she is now symptom free. My son who is nearly 19 is now breaking out all over with GA and I'm suspecting that it's because of his extremely high stress level and eating college food. Normally we don't eat any junk, but that has been added to his diet since eating dorm food. So he is now taking the Vitamin D spray. I do believe that since this is a auto-immune problem that the Vitamin D, probiotics and Vitamin C should help with his immune system and also help his “gut” where we need to start. It all makes sense. Why I have 2 children with GA doesn't make sense to me however. We are also starting Krill Oil and Oregano oil in capsule form to see if they have any benefit. Where can I find the Vitamin D spray? Any type of probiotics? My son who is 8.5 has Granuloma Annulare on the backs of both his legs and the top of his foot. Have had GA for over 3 years now. Creams don't work. Tried the shot on the one on his foot and it's only scabbed over. The doctor said the ones on his legs weren't able to have the shots. They are getting bigger and kind of spreading 🙁 any other advice you have???? Thanks!!! I am so frustated with this! I've tried everything to try to get rid if this.Creams, steroid pills, shots. It started on my arm, elbow , forearm, now it's on my knees, thighs, and stomach. Tonight I'm putting on a mixture of crushed aspirin and ACV. Some one told me to try this mixture at night. Believe me, only try it if your going too bed. It stinks. I'll give all of you an update in about a week, pray that something happens and I can give you all good news.Feel For You All, Know All About It. Glad to hear about all the ways you can possibly treat this problem. I'm 61, had it diagnosed more than 30 years ago. It has only been on my hands, one hand at a time. The lesions would form, and yes, they are itchy and painful if you get your hand wedged on the spots or hit them on something. Ouch. One day after turning 61 I noticed they had all gone, I guess in remission, and hope they don't come back. I haven't changed my eating habits or anything, but had no idea they could form all over your body like that. I'll certainly pray for all of us for a cure and wish everyone the best. Glad to have found this forum because something tells me this is not the end of this. I have had Granuloma Annulare for about 8 years. I went to doctors and went through the steroid treatments like many others. Treatments worked but GA comes back immediately. My GA is on my entire body except, luckily, not my face. I was desperate and returned to internet to see if anyone had found anything to cure GA. I came across this site and read where ACV had been the answer for some. I immediately began drinking 1 oz. in the morning and 1 oz. at night. It's been six weeks and I definately see a difference. I am very encouraged for the first time in years. I just know that this is going to be the answer. I look forward to reporting a 100% cure. I started with this ailment about 3 yrs ago when I notice it under my arm pit! I went to the Dr.s and was told this is GA. Prescription cream took it away in time but now after about two yrs of remission I now have all over stomach going into my groin area and some on back of my legs and again my arm pit! It doesn't itch or anything but the appearance of it is very upsetting! Im going to try the apple cider vinegar first to see if it helps first! I'm so glad I found this site and know many others have to deal with this ugly skin rash also! Thank you for the suggestions!!! I have the exact same areas on body, under both arms, stomach, knees and hands. I have had two tests and two derms diagnose as GA. I have not tried ACV but have tried 3 different steroid creams, cortisone injections, tea tree oil and they come back or spread. Its been almost 10 years and it gets so discouraging, even my homepath dr had no recommendations, I am going to try ACV, so thankful I found this site today. I have been putting up with this unsightly skin condition for years – on my legs, under arms, on my buttocks and on my hand. Creams did nothing. Laser did nothing. Definitely will give the ACV a go and will keep you posted. What do I have to lose? Hello, everyone. I, too, am afflicted with Granuloma Annulare and have been for about 7 years. I tried ultraviolet light therapy 3 times per week but the only benefit I saw was that it made my skin turn the same color so that the red from the GA wasn't as noticeable. But, it started turning my skin splotchy and leathery. Then I tried different creams but they started thinning my skin. The thing that helped me the most was the Kenalog shot but it only lasted 4 months. Doctors typically don't like to give that shot often enough to do the trick. I tried a topical over-the-counter 1% steroid cream with some success but I am afraid that it will thin my skin, too. So, now I will try the apple cider vinegar. I will let you all know how it works. I am so happy I found this forum! If you Google "Granuloma Annular virus cause" you'll find a number of articles that discuss the possible connection. Including the possible connect with Epstein-Barr Virus. If you think there might be a connection with a virus in your history you might consider anti virus agents topically. Echinacea for instance is a great one. I use it a lot as well as Colloidal Silver. I'd use topically for a week or so and see if there is any improvement. If so then I'd continue until the problem is eliminated. I'd also consider using CS orally if the topical seems to work as the virus might be systemic. I'd use CS …two tablespoons twice a day for six months. I was diagnosed with GA the past year. Initially had good results using manuka honey cream and ointment overnight. Lately, it had been red, raw, itchy. I experimented with ACV on left hand and colloidal silver on the right. The colloidal silver worked better than the ACV. Thanks Dave. I'm just following up on how the apple cider vinegar worked for everyone? I have had GA Since I was 12 and I'm now 30. Generalized and all over my body. I've done all the treatments including Puva light and never had any success. When I was younger I had the steroid shots injected directly into the rash and It made it spread all over my body. I'm close to turning to accutane. I will say it completely went away both times I was pregnant but came back full force about a year after. I would love to hear how the ACV works. Also, Dave from Fountain Inn, my mother has the Epstein Barr virus and my sister has Lupus so I'm wondering if I have an autoimmune issue causing this. What is the CS medication? EC: Dave is referring to Colloidal Silver (CS). Crystal, my son had also AG and I was able to cure it by ACV in his bath. I would put between 1-2 cups of cheap ACV ( which is sold in gallon at Wal-mart) to his bathtub and within about 5 months all his spots which were on the bottom of his legs disappeared. This also worked for my daughter's eczema. Let me know if you need more info. Thank you Dave… I've been taking the ACV tablets and taking liquid both in the morning and evening… It's just been two weeks but I think I notice a difference. I will definitely add it to my baths… thank you so much! How long have you been using Apple Cider Vinegar till you saw a difference? I've been suffering 10 plus years now. I am 50 years old. I have had granuloma annular my entire life. When I was little it used to just be in a spot on my wrist and several spots on the top of my feet. They stayed there forever, never fading or growing Did not itch, so I didnt pay much attention to it. The last 10years, it has started spreading all over my body. The only place its not is on my face and my neck. Its on my hands, arms, legs, feet, torso, back, upper arms, thighs .. Its every where and the last 2 months it has started itching like crazy. I have been on steroids, creams, lotions, shots, chemo pills, uv light, chinese medicine, etc .. Nothing helps. I am tired of wasting my money on dermotologists when I know it doewnt help so I stopped going. I have psoriasis as well, but its not as bad as the granuloma. Anything at all that you can offer to help, please let me know. I will try the apple cider again it did not work when I was in my teens. I used apple cider vinegar on my skin all the time when I was in my teens. helped with sunburns and keeping my skin soft. Its cheaper than all the medicines these doctors have put me on. Have you looked into diet? You could have a response to inflammatory foods like gluten, fried foods, sugar or dairy. I am an acupuncturist- but I would suggest a nutritionist who specializes in inflammatory and/or immune issues. As some brought up earlier- this could be related to viral diseases, or diabetes- which would indicates immune or sugar imbalances. Have the spots gone completely away? How long did it take? I'm trying ACV now. I’ve had great success curing the skin troubles of Granuloma Annulare by using DMSO topically. I apply it on a paper towel and then plastic wrap and hold in a few minutes until the burning sensation – as long as you can stand it, around 15 minutes. It’s not really a burn, will subside next day. The bumps are usually gone. I had a huge ring it has mostly gotten rid of now. Will apply it when new bumps come and save myself the issue of watching these things grow large. I have had GA for about 30 years now, and am really fed up with it so going to try some of these treatments. What is DMSO? Luckily, I do not have it on my face but every where else. In answer to the above people who have Granuloma Annulare, I also have the same for the last two years. I found a way to stop every spot in its tract. First I seen on the internet that the fungus travels between the two layers of skin. I bought a large container of hydrogren Peroxide 35 % food value and keep a small bottle about three quarters full in the bathroom along with a box of swabs. Upon going to bed I start with a swab and coat the spots two or three times each. It will burn a bit but only for a few minutes. I do this for three nights then watch them in a few days start to fad away. When coating the spots they will all turn white. I believe that the treatment is going through the first skin and and distroying the fungus. I 'm happy with the results I'm seeing, and now I'm looking for a way to remove the spots. Some where on this web page I seen that Walmart carry a product to remove the spots. I have a lot to be removed. In response to Ed: GRANULOMA ANNULARE IS NOT A FUNGUS!!! Granuloma Annulare is an inflamatory/autoimmune condition. I am a Granuloma Annulare (GA) sufferer too; the first lesion cropped up 15 months ago on the top of one foot and has since spread upwards on my legs and also appears on my elbows. I would like to emphasize GA is NOT a fungus. It is an auto-immune disorder that manifests itself in a skin rash; basically our white blood cells are working overtime. If ACV helps you, wonderful (it hasn't had a significant effect in my case), but be careful about taking it in liquid form as it is highly damaging to tooth enamel. ACV pills are available which I take twice daily. I have also been trying a gluten-free diet, acupuncture and Chinese herbal medicine. Although I am by no means rash-free, the condition has not spread beyond my limbs. Best wishes, everyone. This is one miserable skin disease. I am a medical researcher and I also suffer from GA. I have scoured the medical literature looking for a possible cause and treatment that is effective. What I have discovered is that the cause of GA UNKNOWN. Some believe it is an autoimmune disorder because GA has appeared in all stages of HIV. The research connecting GA with diabetes is weak. One retrospective study identified 12% of subjects positive for GA had diabetes mellitus. Most other case-control studies have failed to reveal any statistically significant correlation between GA and diabetes. Others hypothesize that GA is triggered by trauma, surgery, and insect bites. GA is not related to ringworm, or Lymes disease. The most effective and lesion fading home remedy is applying organic apple cider vinegar to the effected area of the skin and ingesting 1 teaspoon to 1 tablespoon of apple cider vinegar in warm water twice daily. The best to all of you in your quest to get rid of GA! Did you find anything in your research on why GA completely disappears when you are pregnant? I have been a GA sufferer for about 20 years now, and the two times that they went away COMPLETELY was when I was pregnant both times with my kids. It returned several months after giving birth in all the original places. This coincidence needs to be studies for a potential cure. What reaction happens in the body while you are pregnant to heal all the legions? I have Generalized GA for almost 20 years also and it went away during both pregnancies also! I would love to know why… I'm wondering if the cause is hormonal? Have you found out anymore info in regards this? Thank you. Totally agree – caused by gluten intolerance – and elimination of wheat, and Apple cider vinegar is working for me. So, seeing your post was 2012, are you clear of GA now, 5 years later? Hi all… I just had to pass on my success with getting rid of Granuloma Annulare. I had it for about 3 years. I can't say this will work for everyone, as many medical professionals think this could be related to Diabetes and Lupus as well. Go Gluten-free. I tried everything prior to my discovery of my gluten-intolerance. I tried things such as blood tests for diabetes, lupus, celiac disease plus allergy prick tests. Nothing helped me until I got a stool test. This test showed a significant intolerance to wheat. Once I removed this completely from my diet (and you definitely have to read all food labels! ), it went away. It also seems I have an intolerance to almonds too. I think with all the almond products out there, my body doesn't quite like them either. The removal of these two things completely cleared my skin. I hope this can help someone! Good luck! Thanks for the info on going gluten free. I seem to have a wheat issue in that it causes bloating when I eat it…but nothing more. However, I have now had the Granuloma Annulare rash for about 3 or 4 years with no results except temporary with steriod creams/ointments. I just tried light therapy but nothing happening with that. I have had Granuloma Annulare for 46 years. I was in hospital really sick in 1969. I feel I got from blood transfusions, nothing has ever helped tried all the doctor knows. Been to Mayo. I was recently in a comma with bacterial menigitis, GA went away completely. I feel it was milk or wheat or something I am eating because I had none of that for 4 weeks while I was.in the coma, It has come back with a vengeance, Thanks for all the suggestions I am going to try them. Can you please tell me what kind of stool test you had to diagnose your allergen causes of granuloma annulare? Does your wife continue to take the pregnenolone, or did she take it only until the condition cleared up? I just read several medical articles about it. In general, the reports are good, but mentioned several problems that could arise if it is taken for an extended period of time. I'm going to try it anyway. My GA has just begun, and I don't want it going any farther! Have you tried this method for Granuloma Annulare yet. I've been suffering for 10 years now. Tried Apple Cider Vinegar, pills injections, ointments, gluten free diet. So far nothing helps GA. HELP. It looks so bad I have this on tops of feet legs arms hands and now new spot first time on my stomach. I hate when people look at me like a freak show. I have had GA since 1999. I have tried everything except for oral steroids because they only work while taking them and then the GA comes back. I find when I limit yeast and grain intake and take probiotics it helps, but recently the GA started getting much worse no matter what. I just ordered Pregnenolone and will try that when I get back from my next trip. In the meantime, I am going to start the Lysine because that does help. I have suffered from granuloma annulare for 7 yrs. I just ordered pregnenone 5mg. I am at wit's ends with this disease. Is your wife still clear? Has there been any advantages? Our 5 year old daughter has GA and topically applying raw apple cider vinegar is the only thing that has worked to eliminate GAs. We did steroid shots the first two times GA popped up but that wasn't a long term solution! So thankful for ACV. I soak a cotton ball in ACV and use medical tape to fix it over the GA spot. We do that procedure for 3-4 nights and the GA is healed… Actually it looks like poison is drawn out and a scab forms. (A week later the scab is gone. ) Still, waaay better than steroids. We've checked into all known causes for GA over the past year (today we got back a clean bill of health from a CBC w/diff) and haven't uncovered anything. Hey congrats on helping with the GA's! I am currently on night 3 of the topical Apple Cider Vinegar regimen. I was wondering if your daughters GA has come back since her last ACV treatment? Also, how severe was her GA? Did she have a ring? Thank you for your response!! Jason, the Granuloma Annulares still pop up but we can treat them naturally instead of with steroids, which is a positive. She has had a few GAs develop into the ring shape but generally I catch them now before they progress to that point. We're currently on day 2 of having her drink ACV twice a day so I'm hoping for great things on that end. I've been drinking ACV for months and it really helps with my arthritic hands. E – My son just developed GA. He is also 5. I don't think he will drink the ACV, but I will defintely try it topically. When you guys say did he get rings, does that mean it's worse? He has one BIG ring on the top of his foot and 3-4 small rings on each of his legs. I don't know why he all of a sudden got this. It's so upsetting to me. How long do you leave the cotton balls on the granuloma annulare spots? Just wanted to let you know, for granuloma annulare I have tried vit e mix with tea tree oil, apply 2-3 times a day works great. My son had it and doctor said because he is so young there is nothing he can give him. So this is what I did, as I said it worked great. Hope it helps someone!!! I will definitely try this. Even though its not contagious I still don’t like the way it looks and sometimes it spreads to my son’s (6 yrs old) fingers as well. I am 60 yrs old and have have had GA for over 20 years. I also have tried a lot of creams and oils and I want to warn people about the dangers of the steroid creams. Please never use them on your children and never use them too long on yourself. I didn't pay attention and now the skin on the backs of my hands is very thin and easily torn and very sensitive. I have had from severe to mild over the years and 1 thing I have noticed is it seemed to get worse when my skin is dry. Since I started using regular coconut oil to moisturize it seems to really help. I don't know anyone else with this condition so I was delighted to find this site! Thanks for all your tips! Dana in Alberta, coconut oil on GA is good but I heard from an essential oil expert that pomegranate oil was superior. I did find the product online and agree it is wonderful. I have had granuloma annulare for 9 years now. It began as a small patch on my left hand– an ugly red rash, neither itchy nor painful. It has spread to the backs of both hands, up to my middle knuckles. The doc diagnosed it and said that it often is a precursor for diabetes, and that we'd keep an eye on it. Well, my favorite coworker in OKC introduced me to EarthClinic and I read about ACV. I drank it for a few months this past winter — 1 Tbsp ORGANIC ACV with 1Tbsp honey, in warm water, morning and night. In spring, my coworker and my boss noticed that my GA had mostly disappeared! I hadn't even noticed! Oh, it's still there, but VERY much faded. I had to stop drinking the ACV because my teeth were beginning to hurt– now I'm back on it but using a TINY pinch of baking soda in with the vinegar, let it fizz, then add warm water and the honey. I DEFINITELY recommend it. I don't know how long you will have to take it– don't know how widespread or severe your GA is. Best of luck to you!!! My husband has GA and started the ACV 3 weeks ago after I told him about your post. Most of his rashes have faded to very light pink, and he has hopes of them completely disappearing in a short amount of time. He has had it a couple years, but had no interest in taking steroids to try to get rid of it. This seems to be working for him. Thanks for sharing! Regarding ACV for Granuloma Annulare – should it be taken with food? On an empty stomach? Applies topically as well? I have a LONG-standing case of GA (20 years now) and am about will to try anything to get rid of it. Any advice would be greatly appreciated! Tabby– You can take it either with food or on an empty stomach. Topically is fine– won’t hurt a thing. BTW, my coworker told me that you can buy a gallon jug of plain old ACV (from a grocery store) and put 1/4 cup or so of ORGANIC ACV (from the health food store) in it and let it sit a few weeks till the sediment (it’s known as “the mother”) begins to grow in the cheap vinegar and that way you can make your own for way less $$$. MANY thanks!! I’ve been doing quite a bit of reading on alkalinity and so forth, and will try the ACV/honey/baking soda. Will post back when I have something to report! Thanks again. Has anyone actually developed or heard of someone developing diabetes following diagnosis of GA? I’ve read that it can be a precusor to diabetes. Thank you. I got my first GA about 4 years ago on my left forearm. It started out like a small pimple. It is spreading and it is about a 2-1/2" x 3" almost round shape. I had been diagnosed with diabetes before the GA. No I have a GA on my knee about the size of a quarter and one on my left hand first finger knuckle. I've tried lots of stuff, but not the ACV, I will try that and the Colloidal Silver. Jeanette, I was diagnosed with GA a little over three years ago. It started out as 2 backwards C shapes on the back of my hands. I went to my family physician and he did a biopsy to confirm that it was GA. He gave me a topical steroid to put on the spots. They continued to spread even when I put the cream on with Saran Wrap and tape, and slept like that. Finally I went to a dermatologist, who injected the spots directly and gave me a antibiotic cocktail. It got rid of it, but of course it came back. After year 1 my glucose was 100. The highest normal reading. The next year, it was 102. My doctor didn't feel it was anything to worry about. Year 3 it was 123. They ran a A1C test and it was 7.6. The highest normal reading is 5.7. I am now a full blown diabetic. I currently am on 2 different medications and 1 for neuropathy. My sugar levels are still all over the place, despite my best efforts with my diet. I feel my doctor should have ran the A1C test when my glucose was 100. Perhaps I could have been diagnosed pre diabetic and been able to get things under control then. My GA is so far out of control now that I wear long sleeves in 95 degree weather, sweating to death, because it is so bad. People at stores would throw my change back at me to make sure they didn't touch me because everybody thinks it is Ringworm. I'm going to try the ACV topically and orally. Watch those glucose readings. Nickle allergy.. Synthroid meds.. High cholesterol and Granuloma Annulare.. Anyone can relate? I have had Granuloma Annulare for about 4 years and the small spots connect and now looks like a pinkish/purple rash all over my abdomen and trying to spread down my legs and back. Have been using Clobetasol ointment which prevents from spreading if used upon the first notice of a spot, but do not want to continue to use it as it thins the skin and not good long term. The comments here are great and I am going to buy the ACV today and try it both topically and internally. I have read that ACV is also good for acid reflux….which I have used for this and it does work. Yes, my daughter developed granuloma annulare about a month and a half before being diagnosed with Type 1 diabetes. It took us a few months and many medical professionals to diagnose it. (The school nurse thought she had ringworm and didn't want to allow her to attend school.) It seems that when her blood sugars are lower it improves. It was almost gone at one point, but we traveled to Germany and had a hard time keeping her blood sugar at a good level and it returned. I am going to try A.C.V. I am not sure if drinking it or dabbing it on is the best. It seems to be larger spots on 2 sides of lower trunk.. Can drinking it hurt you and how long to take it. So upset by this. Would appreciate all the help I can get. Any creams help also. thanks in advance. I was wondering for those who used the ACV method.. do you drink it as well as apply it to the affected area? If you apply it, how? With cotton swab or mix with other things to make a paste? If I have a sensitive stomach will the Apple Cider Vinegar affect that? My husband has taken the apple cider vinegar pills. I can't quite believe they are as good as taking the vinegar, but certainly worth a try, especially if you don't like the taste of vinegar, as my husband does not. I have been drinking apple cider vinegar in my water for years with no adverse trouble with my teeth, but I do drink it pretty diluted and with a straw.